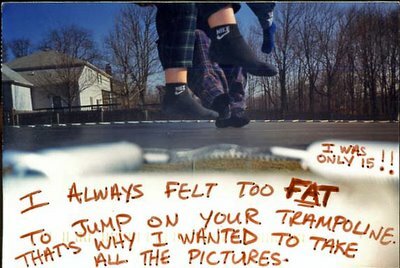 This postcard from PostSecret rang a bell for me. My friend had a trampoline. The two of us would jump on it all summer long. At night, we would roll our sleeping bags on it and sleep outside. We lived on that trampoline. My friend was perfectly willing to jump and flip on the trampoline when guys were there, but I would just stay on the sidelines and hang out. She preferred the spotlight and I willingly gave it up. She was much more acrobatic than I was, so her jumping was more impressive than mine could have been. I always felt that too much of me would jiggle if I jumped on the trampoline in front of the guys. I guess I wasn’t comfortable enough with my jiggly parts. I don’t even know if I am now. I wore a jogging bra all day at CES because I knew I was going to be trying out games where I might jiggle too much. It was uncomfortable and chaffed, but somehow that was better than jiggling too much when I tried out all the equipment.